Dr. Babak Azizzadeh of the Facial Paralysis Institute is the pioneer of the groundbreaking smile reanimation surgery called selective neurolysis. This revolutionary procedure is the first permanent treatment option for patients who do not recover from Bell’s palsy, have synkinesis, facial paralysis, Ramsay Hunt Syndrome, acoustic neuroma or traumatic brain injury. While there are facial paralysis and synkinesis procedures currently available to patients, none are able to achieve the components of a natural smile as impressively as selective neurolysis. Dr. Azizzadeh developed this procedure to improve his patients’ quality of life and non-verbal communication capabilities by creating a natural, spontaneous smile. Selective neurolysis (also referred to as modified selective neurectomy) is the most cutting-edge surgical advancement for patients who are not able to generate an appropriate smile due to partial facial paralysis, permanent Bell’s palsy, or synkinesis. The treatment goes to the root of the problem, which is the abnormal regeneration of the facial nerve. 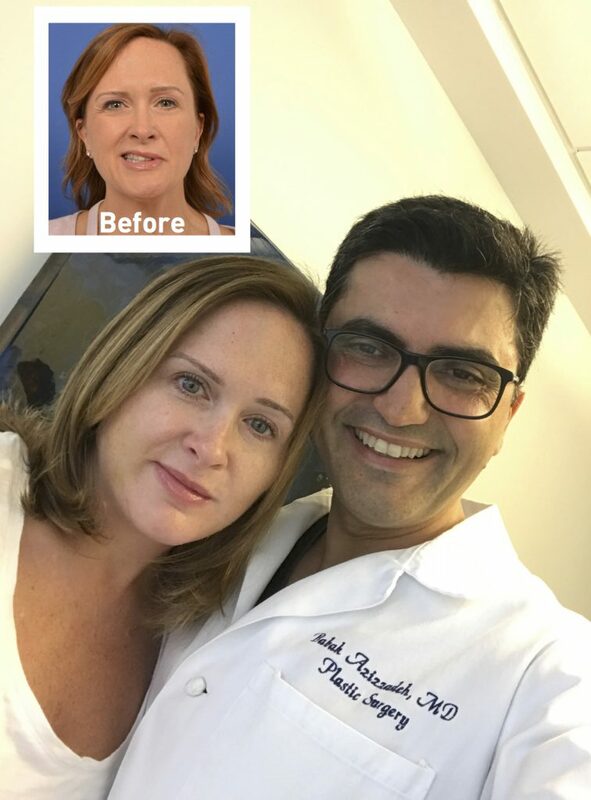 Dr. Azizzadeh corrects this “mis-wiring” and the facial reanimation results are phenomenal. The procedure involves meticulously mapping out the facial nerves with intraoperative electromyography (EMG) and selectively decreasing the activity of the nerves that are counterproductive to the smile mechanism. Additionally, Dr. Azizzadeh will release the platysma muscle that pulls the corner of the mouth down. This technique allows for spontaneous reanimation of the face and a natural looking smile. While selective neurolysis is an intricate operation, it is performed at an out-patient surgery center, downtime and risks involved for the patient are limited compared to other facial nerve surgeries, and results can be seen as soon as one day following surgery. During a patient consultation, Dr. Azizzadeh will evaluate a patient’s current smile capabilities and determine if they are a candidate for selective neurolysis. One of the greatest benefits of selective neurolysis is that Dr. Azizzadeh customizes the surgery to the specific needs of the patient, as no two patients are exactly the same. How Do You Treat Facial Paralysis and Synkinesis With Selective Neurolysis? Most patients who do not recover fully from Bell’s palsy develop synkinesis, which is the simultaneous activation of the nerves. As a result, when patients with synkinesis try to generate a smile, multiple muscles (depressor anguli oris, platysma, orbicularis oris, and buccinators) get activated and the smile appears pulled down and looks asymmetric. A natural smile is spontaneous, displays overall symmetry in the laugh lines, teeth show (both upper and lower) and timing, and moves in an upward direction. Permanent Bell’s palsy and synkinesis inhibit these components of a natural smile. The only true way to get improvement is to impact all of these muscles that are counterproductive at the root of the problem, which is the facial nerves. During a modified selective neurectomy, all of the facial nerve branches that go to the facial muscles are identified. All of the nerve branches that go into the key smile muscles are preserved, while Dr. Azizzadeh reduces the activity of the nerves going into the muscles that negatively impact the smile. This approach allows him to treat the core of the problem and achieve results that are extraordinarily better than any other treatment option. “It’s the first time in 25 years that when I smile, I can see the side of my teeth,” Mary Jo Buttafuoco. What Are the Benefits of Selective Neurolysis? Few facial reanimation techniques help individuals achieve the components of a natural smile. Selective neurolysis has proven to be an effective long-term treatment for synkinesis and significantly enhances patients’ smile capabilities. Additionally, unlike some of the other smile reanimation procedures that require multiple surgeries and can take two to three years to experience smile results, selective neurolysis is a one-stage surgery and results can be seen as soon as one day after surgery with full results in just a couple of months. What Should a Patient Expect from Selective Neurolysis Surgery? Selective neurectomy is a complex procedure, but the recovery period and potential side effects are limited compared to other facial reanimation procedures. Patients experience improvement in the generation of a natural smile within days of surgery, with final results continuing to improve over the next couple of months. Following selective neurectomy, Dr. Azizzadeh may recommend his patients complete a neuromuscular retraining program designed to continue to help facilitate facial symmetry and improve facial movement. The physical therapist will teach a patient the proper exercises and provide customized sessions based on the facial movement needs of the patient. Also, a patient may require periorbital and contralateral Botox after selective neurolysis. Botox consists of a protein derived from the botulinum toxin and is one of the most effective treatments for partial facial paralysis and synkinesis patients. It helps relax unwanted muscle movements in the face and reduce tension in areas of the face that are hyperactive due to synkinesis. What Should a Patient Expect During a Selective Neurolysis Consultation? Dr. Babak Azizzadeh is a Harvard-trained facial paralysis and reconstructive surgeon with a special focus in nerve disorders and treatments. He pioneered selective neurolysis to help partial facial paralysis and synkinesis patients achieve life-changing facial reanimation results. During a consultation, Dr. Azizzadeh will discuss all treatment options with the patient. If Dr. Azizzadeh determines a patient is a candidate for selective neurectomy, he will develop a customized treatment plan. Asymmetric Facelift: Enables a patient to correct facial asymmetry, leading to a more balanced and natural-looking facial appearance. Blepharoplasty (Eyelid Surgery): Helps a patient minimize the appearance of droopy eyelids and may involve the removal of excess fat, muscle and skin. Facial Rejuvenation: A patient can also elect to undergo facial rejuvenation procedures at the same time as selective neurolysis. This can include a facelift and neck lift. Dr. Azizzadeh is happy to teach patients about selective neurolysis and other facial paralysis and synkinesis treatment options. To schedule a consultation with Dr. Azizzadeh, please contact The Facial Paralysis Institute at 310-657-2203 or email us.